Parabola: The shape made when graphing a quadratic equation. Figure 1: Parabola from a conic section. How is the parabola different if the focus and directrix are close together as opposed to far apart? How does the parabola change if the focus is moved to the left or to the right? Click on the blue point on the parabola and drag it. Notice that the length of the two black lines remains equal. Why do these values remain equal? Manipulative 1 - Parabola Created with GeoGebra. A parabola is the shape made when graphing a quadratic equation. A parabola can also be described as a conic section formed by intersecting a right circular conic surface with a plane parallel to the generator of the cone. A parabola can also be defined as all points in a plane equidistant from a line, called the directrix, and a point, called the focus, not on the line. Every parabola also has a vertex and a axis of symmetry. In manipulative 1, click on the purple focus, the red point on the directrix, and the blue point on the parabola and drag them change the figure. How is the parabola different if the focus and directrix are close together as opposed to far apart? How does the parabola change if the focus is moved to the left or to the right? Click on the blue point on the parabola and drag it. Notice that the length of the two black lines remains equal. Why do these values remain equal? Manipulative 2 - Parabola Created with GeoGebra. The vertex of a parabola is at the inflection point of the parabola. The inflection point is the point where the parabolic curve changes direction. In manipulative 2, the vertex is hot pink. The vertex can not be dragged in this manipulative, because the vertex is dependent upon the focus and directrix. The distance from the focus to any point on the parabola is the same as the distance from that point to the directrix. Click on the blue point on the parabola and drag it to demonstrate this property. Click on the points on the slider and drag them to change the equation. Click on the blue point and drag it to move it on the figure. Can you change the variables so that the parabola points left? Manipulative 3 - Parabola as Conic Section Created with GeoGebra. The conic section form of a parabolic equation is Ax2 + Bxy + Cy2 + Dx + Ey + F = 0 where B2 = 4AC and either A ≠ 0 or C ≠ 0. This form allows one to draw parabolas where the directrix is not parallel to the x-axis or y-axis. The sliders in manipulative 6 allow you to change the figure. Note that for some values of A through F, the parabola will be out of the display area of the graph. Also, both A and C must be either negative or positive or the equation is undefined. Figure 2: A bouncing ball captured with a stroboscopic flash at 25 images per second. The best known physical example of a parabola is a ball in free flight. Once the baseball leaves contact with the bat, the trajectory of a baseball hit by a batter closely follows a parabolic path. Another example, shown in figure 2, is a basketball bouncing on a hard floor. Each bounce approximates a parabola. The physical factors that keep it from being a perfect parabola are the deformation of the ball during the bounce and air resistance. Figure 3: A rotating liquid approximates a parabola. A lesser known example of a parabola is a rotating liquid. 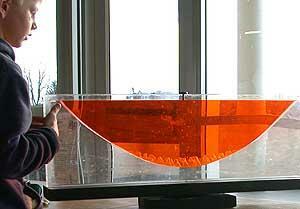 Figure 3 shows a rotating liquid with the interior of the parabola colored orange. Figure 4: A flashlight throwing a focused beam. Another common use of a parabola is a parabolic reflector, used in automobile headlights, flashlights and spotlights, also called searchlights. Figure 3 shows the focused beam a flashlight produces using a parabolic reflector. Manipulative 4 - Parabolic Reflector Created with GeoGebra. When light reflects from a surface, the angle of reflection is twice the angle between the light ray and the normal to the surface. Manipulative 4 shows a blue line that is normal to the surface of the parabola, and how the light beam, shown in green, would reflect off of the surface. Click on the red point on the directrix and the purple focus to change the image. If you wanted to make two searchlights, one with a narrow beam and one with a broad beam, would the focus be closer to the directrix for a narrow beam or a broad beam. Why? McAdams, David E. Parabola . 12/21/2018. All Math Words Encyclopedia. Life is a Story Problem LLC. http://www.allmathwords.org/en/p/parabola.html. Parabola from a conic section. : Marcelo Reis, https://en.wikipedia.org. This file is licensed under the Creative Commons Attribution-Share Alike 3.0 Unported license. https://en.wikipedia.org/wiki/File:Conicas2.PNG. 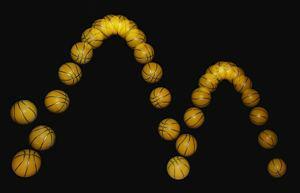 A bouncing ball captured with a stroboscopic flash at 25 images per second. : Michael Maggs, https://en.wikipedia.org. This file is licensed under the Creative Commons Attribution-Share Alike 3.0 Unported license. https://en.wikipedia.org/wiki/File:Bouncing_ball_strobe_edit.jpg. 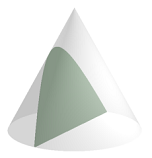 A rotating liquid approximates a paraboloid: Matthew Trump, https://en.wikipedia.org. This file is licensed under the Creative Commons Attribution-Share Alike 3.0 Unported license. https://en.wikipedia.org/wiki/File:Coriolis_effect11.jpg. 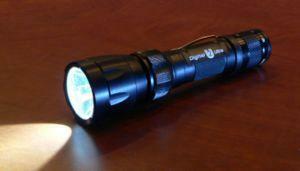 A flashlight throwing a focused beam. : Joema, https://en.wikipedia.org. This work has been released into the public domain by its author. https://en.wikipedia.org/wiki/File:SurefireU2JPG.jpg.